This book had a lot of potential, but to me, it failed to follow through. Allison married a rich man at the age of 18, as her parents were filing bankruptcy, so that she could maintain the lifestyle she had known. At the age of 24, she decides after hearing a conversation between her husband and another man, that he likes his women young, vulnerable, and dependent. Finally realizing her self-esteem is worth more than what money can buy, she leaves. However, she does it on a whim, with no real planning, only taking the jewelry making supplies she loves. In the old home her parents left her, she starts over. Her next-door neighbor is nice and helpful, but she's determined to do everything by herself. Her attitude towards anyone who tries to help is to push them away, determined to prove to herself that she is not dependent on anyone. Rob West, her neighbor across the street, does his best to befriend Allison, but the constant rebuff makes him wary of attempting to do anything for her. But Rob has his own problems. He's trying to figure out what he's doing wrong. He's been divorced twice, both to women he only wanted to love and support. As the ice melts around Allison, she gets to know the real Rob, the one that he hides from everyone, and decides that she likes what she sees. She just wants to see more of it. Both Allison and Rob have self-esteem issues which become overwhelming to me, as the reader, during the last quarter of the book. I like the basis for this story, and the town where it is set – near enough to Allison's past that she is not totally disconnected, but far enough away that it is another world. I had a few issues with their insecurities holding them both to ransom for so long into their relationship, because it felt too drawn out and repetitive. But I did enjoy how Allison's life built up into something more meaningful for her, and that she worked her way through her issues. It may have been a gilded prison, but she clearly felt trapped in her marriage and had the strength to take action to improve her life. Rob was almost more damaged by his past than she was, which seemed slightly strange, but certainly came through in his thoughts. An interesting read about an unusual topic, without unnecessary drama, but plenty to think about. 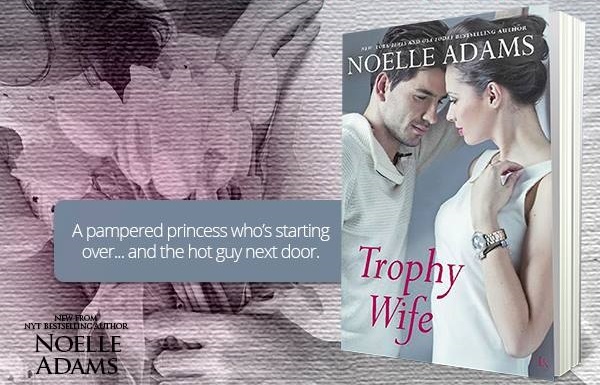 Reviewers on the Wicked Reads Review Team were provided a free copy of Trophy Wife by Noelle Adams to read and review.